Hello friends! Good night and a great week. Fred Mika – Withdrawal Symptoms – For almost three months I’ve been with this album and I can not hear it, and I have not found words to describe the emotion that each one of their songs conveys. Being the first solo work of the Goian drummer Fred Mika (Sunroad), his professionalism is remarkable here, as well as his commitment to present a polished and captivating work where classic hard rock, sometimes with a few AORs as in Wired In (remembers a lot the softest phase of Whitesnake), here with the vocals in charge of Carl Dixon (Coney Hatch, April Wine, Guess Who). Just for this beginning I already feel that my hard earned dollars were not spent in vain. Then we see a range of guest vocalists from the most diverse countries, including Brazilians Rod Marenna, Daniel Vargas, Tito Falashi, Mario Pastore and André Adonis. Describing each song becomes unnecessary, since the 10 songs (taking the short introduction) bring all that eighties feeling, that is, songs that convey emotion, euphoria and even that pleasant nostalgic feeling. Each song is unique, engaging and striking showing a solid work of seductive sound beauty to those who enjoy good music. He could not close with Miss Misery (Nazareth) with the vocals of bandmate André Adonis. 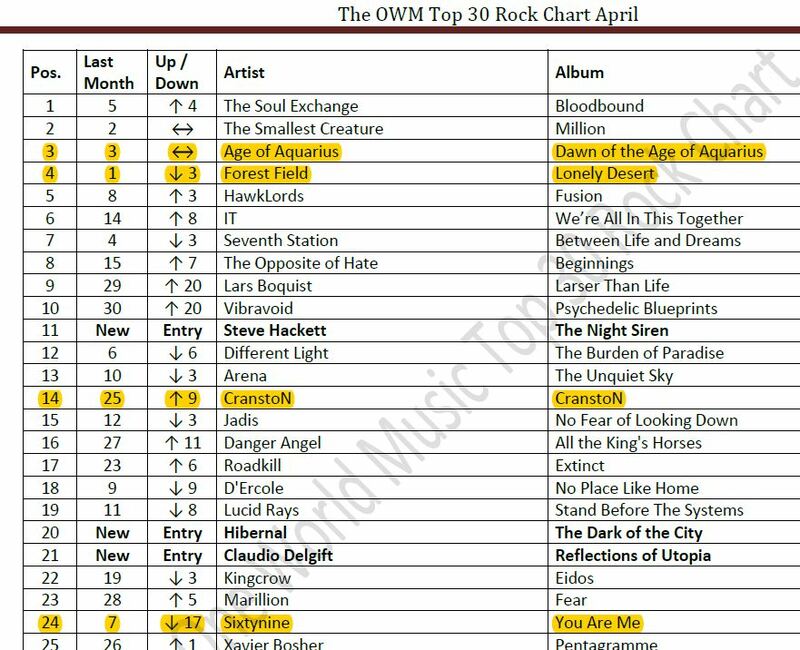 Seems our artists still fare well in the One World Music Radio Rock Top30! 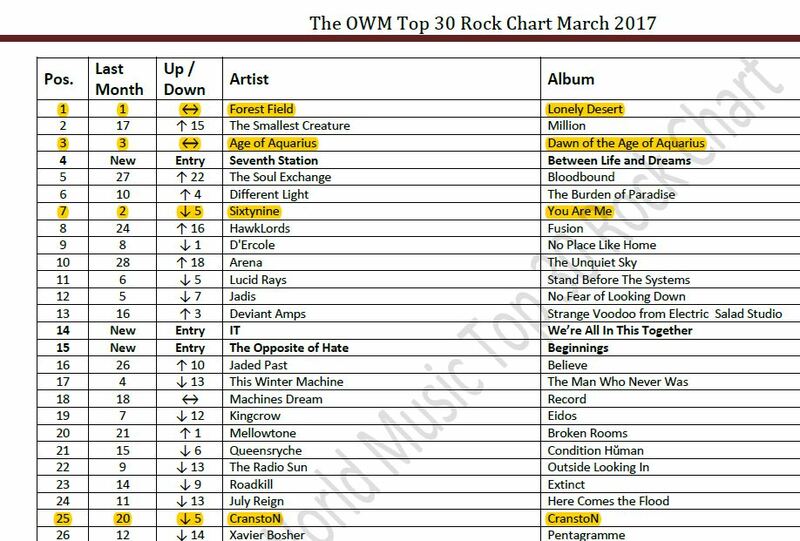 Sunrise Auranaut rise an astonishing 16 positions and find themselves at number 3! Now who said that rock and prog are dead? Thanks to all the listeners and presenters! Of course you can find all these releases at our website www.rockcompany.nl and also online or at your favourite shop! And also our distribution artist Holly Montgomery is nominated with the title track of her album Leaving Eden. If you want to vote, please go to this page to learn how. We wish all the nominees succes! It has happened. It was bound to. Yes, believe it or not, but after 5 amazing months on top of the list, Forest Field had to give up on the #1 spot and landed on position 4. Congratulations to the excellent The Soul Exchange and their great album Bloodbound for taking over! And for the third month in a row, we find the Dawn Of The Age Of Aquarius album from Age Of Aquarius on #3! That in a way is rather unique too. Another surprise is Cranston finding their way UP again, #14 this month. And nice to see another project from singer Phil Vincent, D’Ercole, land the #18 spot. 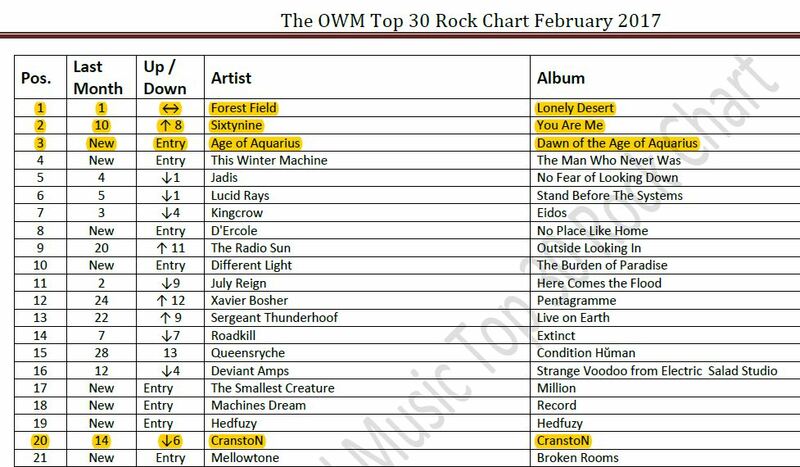 Last but not least for us are Sixtynine taking the number 24 with their rocking You Are Me album. 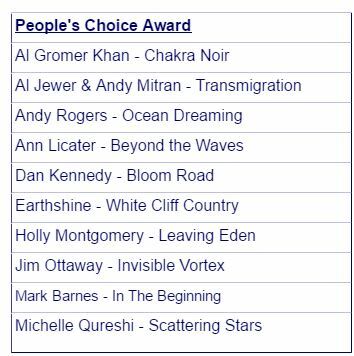 Congrats to the artists and thank you to the presenters and listeners of One World Music Radio! 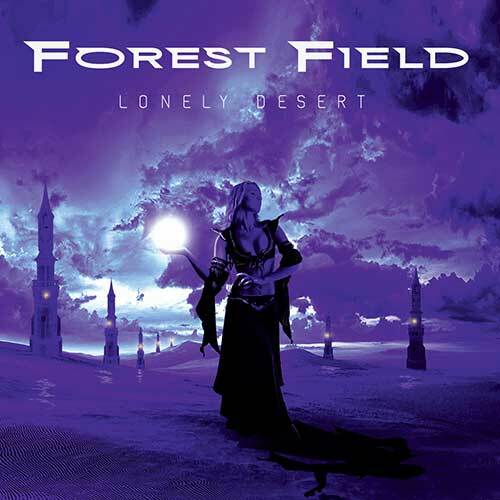 For an incredible fifth month in a row, Forest Field’s Lonely Desert album is topping the One World Music Rock Chart top 30. Rumour has it that is a record. But truth or not, it is an amazing achievement. And besides that, Age Of Aquarius secured position 3 for the second time in a row after entering there the previous month. Sixtynine and Cranston are also still in the list, at 7 and 25 respectively. So it is safe to say that it has been another successful month of airplay at the station. Thanks to all involved! Earthshine – White Cliff Country nominated in the People’s Choice awards. If you want to vote, go to this link to do so. Thanks! 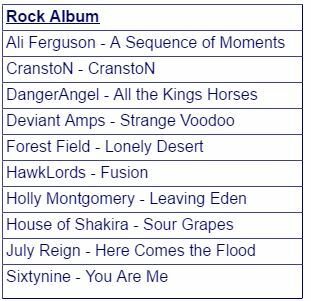 and last but not least, our Distribution artist Holly Montgomery – Leaving Eden is another nominee in the Rock album category. Needless to say we are very happy for our artists for this achievement. We wish the voting judges success with this hard task, what a list!